One of MAC's recent Fall 2013 releases is the MAC Indulge collection. I picked up a gel liner in the shade called Deliciously Rich and an eyeshadow in the shade called Divine Decadence. Is the MAC Indulge collection an indulgence worth the calories? Deliciously Rich is a cool-toned antique bronze brown with loads of gold shimmer. The gold shimmer can look like gold flakes on the lids. Divine Decadence is a warm toned light milk chocolate brown with very subtle golden shimmer. I don't own MAC's Wood Winked, but these shades look very similar to Wood Winked, which is an antiqued bronze gold shade. Deliciously Rich has brown in it, which I don't think Wood Winked has and Deliciously Rich has toasty reddish undertones. The pigmentation of these shades is a little disappointing. I own MAC's Satin Taupe, All that Glitters, Naked Lunch, and Swiss Chocolate, which are all richly pigmented. One dip of your finger and bam boom va va voom! I had to really push, swirl, and twirl my brushes with these two. Also, there was significant fall out, not of the shadow per se, but a lot of golden shimmer settled under my eyes and on my cheeks, which was difficult to get rid of even with a moist wipe. In the picture below, I am wearing Deliciously Rich all over the lid. I attempted to apply it with a shader brush first, but that did not work out very well. I would suggest using your fingers, which is what I did, and then blend it out with a blending brush. Deliciously Rich sets in place very quickly. It did not budge when I tried to blend it with my finger, but I was able to blend it with my blending brush. I did use a primer as a base, so that could also partly be a reason for Deliciously Rich drying so quickly. In the picture below, I added Divine Decadence all over the lid with a shader brush. I also used this color to defining my crease and blending. I really like the two eye products paired together. Personally, I like limited my eye makeup to one or two shades and using as few shades as possible create a subtle mono-color gradient look. If you are someone who likes neutral smokey eye makeup looks, these two eye products are worth adding to your makeup collection. However, if you like variety and using multiple colors to create dimension and light to dark gradients, like a deep crease, luminous lid, and high arches, using both the colors might be too dull for your liking. Deliciously Rich is meant to be a gel liner. This may work as a very subtle eye liner for someone who has a fair/light skin tone with light hair color. I don't think this would suit me as an eyeliner. I don't even like brown eyeliner. I love the seductiveness of rich black winged liner look. Deliciously Rich might also be fun to use on your lower lid. I noticed that that is a popular look this season. I am not a fan of the sultry raccoon eyes, but it is fun to be free and color outside the lines at times. Overall, I do like these two products and will continue to use them on special occasions. If you are a big fan of MAC shadows, neutral yet smokey eye makeup, and don't mind the fall out, then I would recommend these. Also, the pigmentation is not awful. When I think of awful I think of MAC's Carbon or the infamous (in my opinion) Urban Decay Naked I and II. It just isn't as good as the other permanent MAC cult favorite shades I mentioned above. Those are beautiful colors! 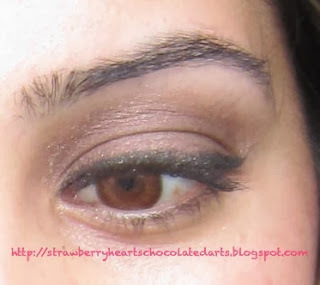 I love any eyeshadow that's bronze! Very pretty colors! And gorgeous looks! But I agree, I prefer the drama of black liner.